The new LED STIX offer discerning design devotees a striking and decorative form of LED lighting. Measuring some 22 cm in length, the rounded silver light stick has four LEDs along its lateral side, lending it the look of a gleaming magic wand. With a multitude of different mounting options, it can conjure a glow around all those features that are crying out for accentuation. Sideboards, vases, a favourite picture on the living-room wall or a romantic table-for-two, whatever the application, the innovative light-emitting diodes of the LED STIX always cast the right light in the right direction. The flexible fastening plate can be used to mount the LED STIX to a table or wall, opening up a varied range of uses. For example, users can fix the plate to all surfaces using either the practical adhesive surface or a boring fixture. The LED STIX are then inserted or laid into the magnetic mounting of the fastening plate and can thus be arranged alongside or perpendicular to walls or objects. What's more, the fastening plate can also be converted into a transportable base. 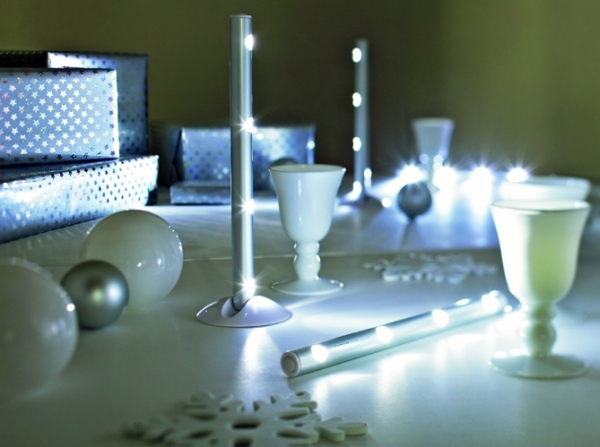 The LED STIX are simply inserted vertically into the holder like a candle and placed on the table or the floor. With its four LEDs, the 22-cm-long light stick will bring all those dark corners out of the shadows.